My 5-day-old baby wearing a Kissaluvs fitted diaper. When my first child was an infant, he had "pooplosions" almost every time he pooped. I'm going to estimate 90% of the time he pooped the poop went up his back and ended up all over his onesie. The reasons are simple: disposable diapers have a slick luge-like surface and very weak elastic around the back; infant poop is pretty runny; and infants tend to poop with a fair amount of force. I used to live in fear that one of those poop-up-the-back incidents would occur at a particularly inopportune time, like when he was wearing one of my favorite outfits, at church or while shopping, or when I forgot to replace the extra clothing stash in the diaper bag. I distinctly remember how carefully I would transport him to the changing table after I heard him poop, gingerly carrying him upright by his arms and then unsnapping his onesie and pulling it far up his back before laying him down on his back in the hopes of keeping (additional) poop off his clothes. One of the wonderful surprises of cloth diapers was that cloth diapers eliminated pooplosions completely. My second baby (who wore cloth diapers from birth) pooped up her back exactly zero times while wearing cloth diapers. (She did have a few pooplosions while wearing disposables.) My third baby, now a few months old, also has never pooped up her back while wearing a cloth diaper. It's a beautiful thing. Here are my favorite cloth diapers for newborns. From 0 to about 3 months, we use Kissaluvs size 0 (5-15 pounds) fitted diapers. A fitted diaper is shaped like a disposable diaper and closes with snaps or Velcro. The Kissaluvs fitted diaper closes with snaps. The big advantage of using a fitted diaper is that they have elastic at the legs and back, which makes them great at containing messy poops. Now any cloth diaper (including the humble prefold simply folded in thirds) will allow fewer pooplosions than a disposable, but the Kissaluvs fitted diaper is legendary for being leak-free. The newborn size also folds down in front so you can keep the umbilical cord region dry. You do need to use a cover over the fitted diaper to make it waterproof. 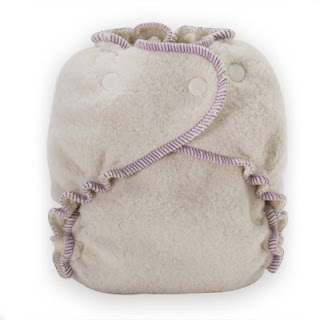 Since your cover will rarely get soiled while using a fitted diaper (because the fitted diaper contains the messes so well), you can purchase fewer covers or use a wool cover if you want to (wool covers are more expensive and a little higher maintenance, but have the advantage of being all-natural and more breathable). We use Prorap, Thirsties or Imse Vimse covers with our Kissaluvs fitted diapers. But I'm thinking of trying a wool cover this time around! How often does your baby poop up his or her back? What are your favorite newborn diapers? holy- i had NO idea of this fact of babies!! (and I thought I had collected quite a bit of info after working w babies and mothers for the past five years). Oh yes, just ask any parent about pooplosions. Anyone who's used disposables will have a story to tell. My sister has fond memories of scrubbing and treating poopy stains in her baby's clothes almost every night after the baby was put to bed. My friend's baby had a pooplosion on my wedding day, while I was holding her on my lap! I never did get that poop stain out of my wedding dress! "Pooplosions" happened a bunch with my firstborn; never with my second. The difference: cloth diapers!! That's one of the first things I tell people when they ask about cloth diapering (and it's my first line of defense when I see the "you're-completely-nuts-for-cloth-diapering" look in someone's eyes). Oh, and my favorite newborn diapers are the Green Mountain Diapers newborn-size organic prefolds with Thirsties cover in x-small. This came as a complete surprise -- I thought I'd hate prefolds, but they're my favorite way to diaper. Heather, I'm curious to know whether you use a snappi or anything else to close your prefolds with your newborn, or if you just fold them in thirds like I do. Prefolds are my favorite way to diaper once we are past the pooplosion stage. Do you find that prefolds do the trick too? Note to readers: Prefolds are WAY less expensive than fitted diapers. My sister uses only prefolds and she said they definitely stop most but not all pooplosions. I use a Snappi to close the prefolds. They just seemed to hold everything together better for me (and keep everything in). I used the Bummis Tinifit, too, when my baby was a newborn -- we didn't have a "pooplosion" with either the prefolds and the Bummis (though we had issues with leaking from wetness). If I were to do it all over again, I'd skipped the Bummis and just do prefolds. In fact, when my baby was only a couple months old, he had his baby blessing at our church and he was wearing an entirely white outfit (can you imagine what a yellow pooplosion would look like in that?! Yikes!). I remember that I put him in a prefold that day because I was certain that if he pooped, it wouldn't leak. I swear by the Green Mountain Diapers and Thirsties covers. After almost a year of cloth diapering, they haven't failed me yet. Thanks so much for this recommendation! I haven't looked into this brand before and I'm currently trying to decide what route I want to go as far as cloth diapering our babe due in May. We didn't start cloth diapering Baby till he was out of the newborn stage so this is new territory for me. Also, thanks for linking up at the Green & Natural Mamas Linky! We found the same thing with disposables - which is to say, there isn't even any more laundry, really, because you're just going to be cleaning poop off clothes if you put them in pampers! That's a great point about the laundry! Such a good point! I have a three month old (my first) and he's never had poo up his back. We've had a few explosions out the legs of the diaper (normally when daddy or grandma were diapering and when the too small diapers were used) but hardly at all when the correctly sized fitteds were used. We use flats, fitteds and prefolds. A few are homemade but most are from Green Mountain Diapers. Loooove their Workhorse Fitteds! For covers we use wool longies (Disna and Ruskovilla Oy)and wool wrap around covers (Biobottoms). That's two votes for Green Mountain Diapers -- I'll have to take a look at their fitteds. Also, thanks for sharing the wool products you use. I'm hoping to give those a try this time around. I used expensive diapers for the first 6 months, and they seemed fine. The last two batches in the larger sizes have had major problems. They split, leaving gooey silica all over my son and his bedclothes. It is a good thing he was wearing a one-piece, or else the silica would have been all over his bed. I thought I had gotten a bad batch, but the new box did the same thing. I think it is dangerous and negligent of them to have defective diapers out there. I'm using a new brand from here on out. Was honest company the good or the bad one? I'm not sure. I can tell you I haven't heard anything bad about Honest disposables, which have been around for several years now, but I've never used them myself.